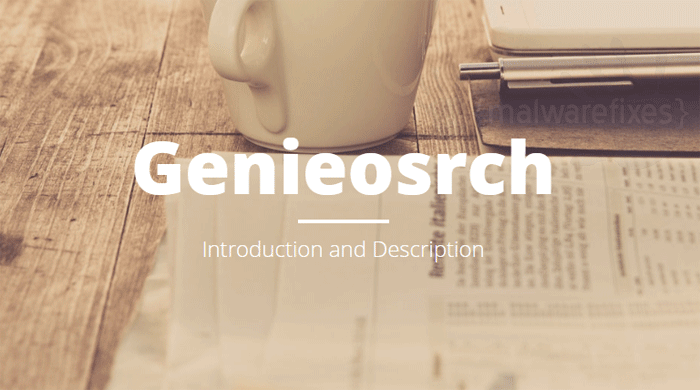 Genieosrch is a potentially unwanted program that was first became infamous as Genieo, which attacks Mac computer systems. This new strain of adware has its focus on PC users and is employing deceiving scheme to gain an entry. In fact, it is promoted as a unique software installer that improves the process by using its robust installation manager. Genieosrch claims to let user download their favorite apps in fastest and most convenient way. Without knowing the background and adware association of Genieosrch, many computer users assume that it is a worthy tool to have on their system. They have no idea that this little program may cause huge impact on the browser when fully installed. Just like its Macintosh counterpart, Genieosrch for PC intends to perform immense changes on favorite browser applications such as Google Chrome and Mozilla Firefox. It can alter configuration of homepage, new tab, and search tool, which will make these pages to present Go.genieosrch.com as default page setting. Furthermore, Genieosrch is known as software bundle that carries additional PUP with intention of populating the target computer with unwanted software. As you can see, Genieosrch is not just an intrusive type of unwanted program. It also acts as carrier of dubious applications that can lead to further adware infection. Thus, it is highly suggested to get rid of this threat as soon as possible to avoid additional damage. Below is a complete guide to remove Genieosrch from the computer. 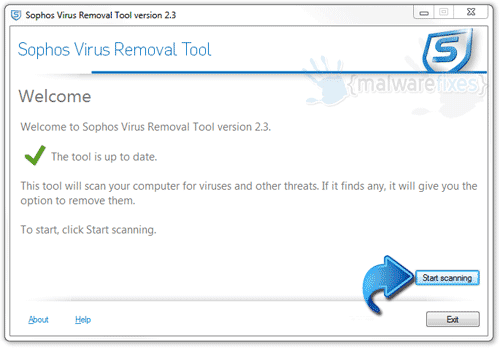 Use the procedure in exact order to guarantee total removal of adware. Below is a systematic instruction that is very useful in getting rid of the potentially unwanted program (PUP) from compromised computer. Most adware and unwanted programs are using a program called browser extension to be able to take over the settings of internet applications. Therefore, we highly recommend to check and remove the extension that is closely related to Genieosrch. 3. Find Genieosrch or relevant entry and remove it from Google Chrome. 4. Look for object that is pertaining to Genieosrch and remove it from the browser. 5. Select Genieosrch or relevant entry and remove it from Safari. 6. Lastly, go to Safari Settings once again and select Downloads from the drop down list. 7. If Genieosrch.safariextz is present, click on Clear button to remove the unwanted extension. 3. Look for and Remove or Disable entries of Genieosrch from Toolbars and Extension and Search Providers section. 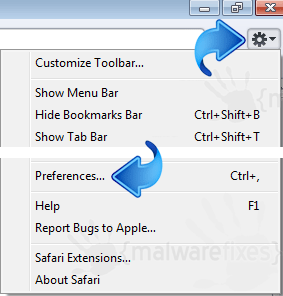 If Genieosrch is still present on the IE browser, another option is to remove the adware from Windows Control Panel. 7. Select Genieosrch or recently installed unwanted entry. Then, click on Uninstall to remove it from Windows system. In addition to the procedure, we suggest scanning the computer with AdwCleaner tool. Possibly, there are some traces of Genieosrch on the browser that was not deleted during the preceding steps. This tool will scan the computer and check for presence of malicious applications. 2. When the download has completed, please close all running programs on the computer especially browsers affected by Genieosrch. 4. AdwCleaner searches the computer for malicious programs, extensions, plug-ins, adware, and any items that may be associated to Genieosrch. Preceding steps may have removed Genieosrch from the browser already. This next procedure is needed to double-check that browser is free from any adware remnants especially from Genieosrch. Avast Browser Cleanup is a free tool that restores the browser to its initial, clean state. It will get rid of annoying browser extensions, toolbars, and search hijackers. 4. If Avast Browser Cleanup verifies if you want to permanently delete suspicious entries, click Yes to proceed with the removal of Genieosrch. Lastly, we will scan the computer with a multi-function security program. This will inspect the computer for possible presence of virus, malware, rootkit, adware as well as unwanted homepage like Genieosrch. 5. Internet connection is required when running this scanner in order to download important updates. Make sure that everything is up-to-date to effectively remove malicious program like Genieosrch. 6. Click the button to carry out the Scan. This will check the system for presence of malicious objects, malware, and viruses. The tool reveals items that were found linked to Genieosrch and other suspicious entities. Be sure to remove all identified threats. Not all adware and PUP’s are the same. Some cannot be removed by deleting relevant extensions and codes. On this instances, resetting the browser to default configuration is the only best solution. If Genieosrch is still bothering you after completing all the steps above, please execute the procedures below to reset the settings of affected browser program. 3. Scroll down and expand Advanced settings area. 5. Click on Clean Up Computer. On next page, please click FIND to proceed. This feature of Google Chrome aims to find harmful software and remove it instantly. If unable to delete Genieosrch, the other option is to Reset Google Chrome settings to its original defaults. Just go back to previous page (Clean Up Computer) and reset the settings. See more details on this page. If Mozilla Firefox is affected by Genieosrch and procedures above were not helpful, we suggest that you carry out these steps. This process can fix the issue by restoring Firefox browser to default factory state. Most browser data will be affected but not bookmarks, browsing history, passwords, and internet cookies. Extensions and other installed plug-ins maybe deleted by this function. Therefore, if you wish to remove specific extension only, please see manual add-on removal from this link. 4. The reset process will automatically close the browser and proceed with the restoration. Next, it will display a list of restored data. Genieosrch should be gone by now. Click Finish to close the current window and open a fresh window of Mozilla Firefox. 4. Pop-up window will appear. 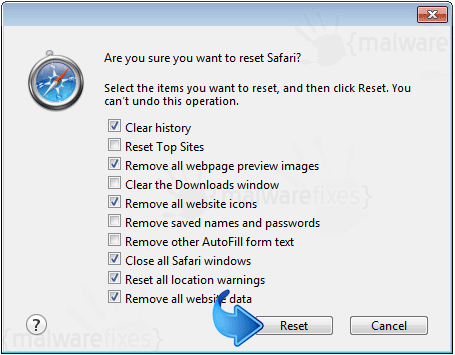 You may select all boxes for total reset or follow the options below if you only want to remove Genieosrch from Safari browser. This process will not affect browsing history, bookmarks, and favorites. Add-ons and other integrated codes will be deleted including those that are linked to Genieosrch. If you choose to perform the procedure manually, please view instructions here.